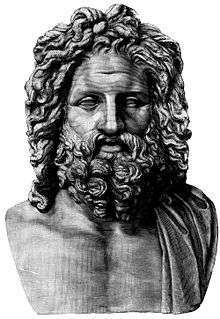 Zeus (/ˈzjuːs/; Ancient Greek: Ζεύς, Zeús, [zdeǔ̯s]; Modern Greek: Δίας, Días [ˈði.as]) was the sky and thunder god in ancient Greek religion, who ruled as king of the gods of Mount Olympus. His name is cognate with the first element of his Roman equivalent Jupiter. His mythologies and powers are similar, though not identical to those of the Indo-European deities such as Indra, Jupiter, Perun, Thor, and Odin. He was respected as an allfather who was chief of the gods and assigned the others to their roles: "Even the gods who are not his natural children address him as Father, and all the gods rise in his presence." He was equated with many foreign weather gods, permitting Pausanias to observe "That Zeus is king in heaven is a saying common to all men". His symbols are the thunderbolt, eagle, bull, and oak. In addition to his Indo-European inheritance, the classical "cloud-gatherer" (Greek: Νεφεληγερέτα, Nephelēgereta) also derives certain iconographic traits from the cultures of the Ancient Near East, such as the scepter. Zeus is frequently depicted by Greek artists in one of two poses: standing, striding forward with a thunderbolt leveled in his raised right hand, or seated in majesty. The Chariot of Zeus, from an 1879 Stories from the Greek Tragedians by Alfred Church. Zeus, at the Getty Villa, A.D. 1 – 100 by unknown. "Cave of Zeus", Mount Ida (Crete). He was raised by a goat named Amalthea, while a company of Kouretes— soldiers, or smaller gods— danced, shouted and clashed their spears against their shields so that Cronus would not hear the baby's cry (see cornucopia). According to some versions of this story he was reared by Amalthea in a cave called Dictaeon Andron (Psychro Cave) in Lasithi plateau. He was raised by a nymph named Cynosura. In gratitude, Zeus placed her among the stars. He was raised by Melissa, who nursed him with goat's milk and honey. He was raised by a shepherd family under the promise that their sheep would be saved from wolves. 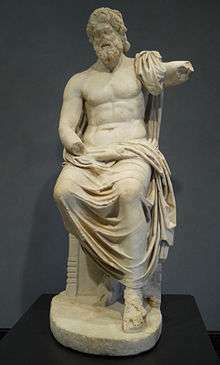 Colossal seated Marnas from Gaza portrayed in the style of Zeus. Roman period Marnas was the chief divinity of Gaza (Istanbul Archaeology Museum). 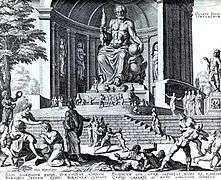 After reaching manhood, Zeus forced Cronus to disgorge first the stone (which was set down at Pytho under the glens of Parnassus to be a sign to mortal men, the Omphalos) then his siblings in reverse order of swallowing. In some versions, Metis gave Cronus an emetic to force him to disgorge the babies, or Zeus cut Cronus's stomach open. Then Zeus released the brothers of Cronus, the Gigantes, the Hecatonchires and the Cyclopes, from their dungeon in Tartarus, killing their guard, Campe. As a token of their appreciation, the Cyclopes gave him thunder and the thunderbolt, or lightning, which had previously been hidden by Gaia. Together, Zeus and his brothers and sisters, along with the Gigantes, Hecatonchires and Cyclopes overthrew Cronus and the other Titans, in the combat called the Titanomachy. The defeated Titans were then cast into a shadowy underworld region known as Tartarus. Atlas, one of the titans that fought against Zeus, was punished by having to hold up the sky. After the battle with the Titans, Zeus shared the world with his elder brothers, Poseidon and Hades, by drawing lots: Zeus got the sky and air, Poseidon the waters, and Hades the world of the dead (the underworld). The ancient Earth, Gaia, could not be claimed; she was left to all three, each according to their capabilities, which explains why Poseidon was the "earth-shaker" (the god of earthquakes) and Hades claimed the humans that died (see also Penthus). 3Some accounts say that Ares, Hebe and Hephaestus were born parthenogenetically. 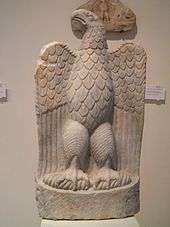 Marble eagle from the sanctuary of Zeus Hypsistos, Archaeological Museum of Dion. With one exception, Greeks were unanimous in recognizing the birthplace of Zeus as Crete. Minoan culture contributed many essentials of ancient Greek religion: "by a hundred channels the old civilization emptied itself into the new", Will Durant observed, and Cretan Zeus retained his youthful Minoan features. The local child of the Great Mother, "a small and inferior deity who took the roles of son and consort", whose Minoan name the Greeks Hellenized as Velchanos, was in time assumed as an epithet by Zeus, as transpired at many other sites, and he came to be venerated in Crete as Zeus Velchanos ("boy-Zeus") often simply the Kouros. The stories of Minos and Epimenides suggest that these caves were once used for incubatory divination by kings and priests. The dramatic setting of Plato's Laws is along the pilgrimage-route to one such site, emphasizing archaic Cretan knowledge. 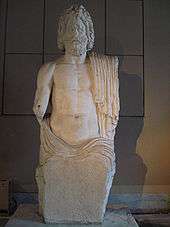 On Crete, Zeus was represented in art as a long-haired youth rather than a mature adult, and hymned as ho megas kouros "the great youth". Ivory statuettes of the "Divine Boy" were unearthed near the Labyrinth at Knossos by Sir Arthur Evans. With the Kouretes, a band of ecstatic armed dancers, he presided over the rigorous military-athletic training and secret rites of the Cretan paideia. The myth of the death of Cretan Zeus, localised in numerous mountain sites though only mentioned in a comparatively late source, Callimachus, together with the assertion of Antoninus Liberalis that a fire shone forth annually from the birth-cave the infant shared with a mythic swarm of bees, suggests that Velchanos had been an annual vegetative spirit. The Hellenistic writer Euhemerus apparently proposed a theory that Zeus had actually been a great king of Crete and that posthumously his glory had slowly turned him into a deity. The works of Euhemerus himself have not survived, but Christian patristic writers took up the suggestion. For more details on this topic, see Lykaia. Laurel-wreathed head of Zeus on a gold stater, Lampsacus, c 360–340 BC (Cabinet des Médailles). In some cases, cities were not entirely sure whether the daimon to whom they sacrificed was a hero or an underground Zeus. Thus the shrine at Lebadaea in Boeotia might belong to the hero Trophonius or to Zeus Trephonius ("the nurturing"), depending on whether you believe Pausanias, or Strabo. 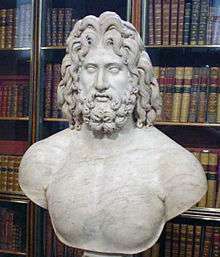 The hero Amphiaraus was honored as Zeus Amphiaraus at Oropus outside of Thebes, and the Spartans even had a shrine to Zeus Agamemnon. Roman cast terracotta of ram-horned Jupiter Ammon, 1st century AD (Museo Barracco, Rome). Zeus is mentioned in the New Testament two times, first in Acts 14:8–13: When the people living in Lystra saw the Apostle Paul heal a lame man, they considered Paul and his partner Barnabas to be gods, identifying Paul with Hermes and Barnabas with Zeus, even trying to offer them sacrifices with the crowd. Two ancient inscriptions discovered in 1909 near Lystra testify to the worship of these two gods in that city. One of the inscriptions refers to the "priests of Zeus," and the other mentions "Hermes Most Great"" and "Zeus the sun-god." The Iliad is a poem by Homer about the Trojan war and the battle over the City of Troy. As God of the sky, lightning, thunder, law, order, justice, Zeus controlled Ancient Greece and all of the mortals and immortals living there. The Iliad covers the Trojan War, in which Zeus plays a major part. By controlling many of the character's fate, he is arguably the most important character in the text. A statue of Zeus in a drawing. When Zeus was atop Mount Olympus he grew upset with mankind and the sacrifices they were performing on one another. Furiously, he decided it would be smart to wipe out mankind with a gigantic flood using the help of his brother Poseidon, King of the Seas. Killing every human except Deucalion and Pyrrah, Zeus flooded the entire planet but then realized he then had to restore society with new people. After clearing all the water, he had Deucalion and Pyrrah create humans to repopulate the earth using stones that became humans. These stones represented the "hardness" of mankind and the man life. This story has been told different ways and in different time periods between Ancient Greek Mythology and The Bible, although the base of the story remains true.